In the parable of the sower, we read that some seeds which fell on the rocks were scorched to death by the sun, while the ones that fell among the thorns were choked to death (Mark 4:5 - 7). Unlike the sower's seeds, one Nigerian, nay an Ebonyi man, with unconquerable spirit has always flourished whether in fertile soil or on the rocks. This unique man who has excelled both in clement and inclement weather as well as in familiar and strange terrains is Senator Emmanuel Uzor Onwe. I knew him just as a master of letters for whom words bend even backwards to convey his thoughts and as a politician who lives his creed; but when I met this unassuming London School of Economics Ph.D-holder and a member of the Honourable Society of Lincoln's Inn at his expansive rice farms with a cumulative size of 500 hectares at Ezillo in Ebonyi state, I realized the futility of trying to fit versatile personages into single labels or descriptive templates. The most interesting thing about this highbrow academic and lawyer-farmer is neither the humongous size nor the scope of his farm. Rather than those, the greatest attractions were the commitment, diligence and detailed attention which this meteor invests in his farm. Emmanuel Uzor Onwe tends his crops the way doting mothers do to their newborn babies by applying farm inputs on time, raising up bent plants by proping them on erect ones as the need arises and removing any weed on sighting it among the rice plants. Onwe does not farm by proxy: He is directly involved in his farm, and his supervision itenerary is as unpredictable as the rapture. This puts every farm hand on his or her toes for fear of losing the opportunity of the living wages and other positive reinforcements which Onwe gives his workers. Born without silver-spoon in the rural community of Echara in Ikwo Local Government Area of Ebonyi state, Emmanuel Uzor Onwe is a personification of excellence and a shinning example of a serial positive conqueror: He conquered his humble background through scholarship and studied at London School of Economics, an ivy-league citadel of learning which has always been the exclusive preserve of people born with golden-spoon. Onwe conquered the world of western elites and their phobia against blacks by winning Sir Thomas More Award at the Inns of Court School of Law; and by rendering impeccable services in fiduciary capacities to the international community and mankind in general at Amnesty International without creating doubts about his integrity. Above all, Emmanuel Uzor Onwe conquered the complexes and emotions which often made Africans lose their true identities in similar sojourns. He returned to Nigeria, versatile and fully developed in character and learning, with his true identity as an Ikwo countryman and a Nigerian patriot untainted; he speaks his Ikwo dialect effortlessly. In 2007, Emmanuel Uzor Onwe brought his therapeutic touch to the ailing Nigerian leadership which has been the bane of the Nigerian project by joining the ever-intriguing Nigerian politics. He contested the Ebonyi central senatorial district election on the platform of Peoples Democratic Party, PDP. Petrified by Onwe's intimidating profile and impregnable candour, the godfathers of Ebonyi politics abandoned all the rules of pre-election engagement and foisted someone who did not contest the nomination on the party as candidate. Emmanuel Uzor Onwe's spartan will came in handy. After three and half years of high-profile legal fireworks, the Court of Appeal in Enugu ordered the inauguration of Emmanuel Uzor Onwe as senator representing Ebonyi central senatorial district. Senator Emmanuel Uzor Onwe spent six eventful months [between 10th August, 2010 and January 2011] in the red chambers of the Nigerian National Assembly before the unrelenting beneficiaries of the old order moved the Supreme Court of Nigeria into assuming jurisdiction in a pre-election matter. The Supreme Court set aside the judgement of the Court of Appeal; and being the finite court in Nigeria, Senator Onwe had no other choice in that particular matter. Onwe, an unquenchable political activist, offerred himself for the same position in 2011 on the platform of All Progressive Grand Alliance, APGA, and was already leading when the polls were terminated midstream on flimsy grounds. He refused to contest the re-scheduled election which results were ostensibly predetermined even before the polls. A thorough-bred political activist and social engineer, Emmanuel Uzor Onwe is always at home with the Nigerian masses whose waning spirit and power he appears to be divinely called to revive and inspire to enable them exercise their natural right to tame the excesses of those who manage public trust. Through his Njiko Igbo socio-cultural group, firm and informed newspaper commentaries and opinions on public affairs and other high-flying social engagements he took up alongside eminent Nigerian statesmen between 2011 and 2014, Emmanuel Uzor Onwe catalyzed the jactitation of the traditional institutions and their rural subjects across the length and breath of Nigeria to demand good governance through lawful means. The increment in the number of voices of reason and new consciousness which we hear all over Nigeria is not unconnected with Onwe's historic efforts. When the socio-political battle for the soul of Ebonyi state began in November 2014, Emmanuel Uzor Onwe was naturally in the trenches with Ebonyi masses whom he believed have the unassailable right to choose who should lead them. 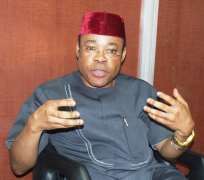 His "Divine Mandate" label on the struggle aptly explains the victory that followed the struggle and the thrust of the resultant administration of Apostle David Nweze Umahi in Ebonyi state as well as Umahi's unequaled developmental exploits. Emmanuel Uzor Onwe, a leader and follower wrapped together, is the Honourable Commissioner for Information and State Orientation in Ebonyi state. Unlike his colleagues in other states who turned themselves into mere propagandists of their respective states, Onwe restricted himself to projecting the galaxy of the Divine Mandate administration's groundbreaking achievements to the world and defending the administration from its traducer's. Onwe, an image-maker of a rare breed would rather keep quiet than say things which truth-value he was yet to determine. When in reaction to the dwindling Nigerian petro-economy the Umahi administration launched its Agricultural revolution programme asking every Ebonyi man to go back to the farm, Onwe who preached the new policy had to match his words with exemplary actions and reference points. He embarked on commercial farming which size and yield attracted the attention of the Zero-hunger team. Former President Olusegun Obasanjo led the Zero-hunger team in an inspection tour of the farm in the last quarter of 2017. To Onwe's credit are hundreds of employees engaged in his farm; the creation of a unique and exclusive brand of organic rice known as A-B Rice; the donation of five tonnes of A-B Rice to Ebonyi State Government in August 2018; good harvests which augments local food security and has potentials to earn foreign exchange to Nigeria; and opportunities for expansion and diversification to create more employment opportunities. Onwe's call for Food Security Summit in Nigeria has yielded positive reactions from the Federal Government. He equally wants a frontal approach to mechanization of Agriculture, provision of functional storage facilities to take care of excess farm produce as well as provision of basic amenities in the hinterlands to improve the quality of life therein and stem urban-rural migration. A compassionate Christian of the denomination of the Presbyterian Church of God who is not given to the gallery, Emmanuel Uzor Onwe is a practical charity worker who radically and quietly changes the status of his beneficiaries without subjecting them to indignity and humiliations before the camera. The lists of indigent students and the sick on Emmanuel Uzor Onwe's private scholarship and free medical programmes are longer than those of many council areas. The hungry also feed fat from his farm produce which he generously shares to them. For him, charity work is a private matter between him and God and so he handles it the way cats handle nature's call. Esteemed readers, it is my profound pleasure to present Senator Emmanuel Uzor Onwe, a creative voice in the Nigerian project, a living legend and positive conqueror who has excelled among human thorns and even on rocky grounds to you. In making this presentation, it is my desire that we spare a little moment to sing Senator Emmanuel Uzor Onwe - a man who can lead and as well follow, a rare gift to mankind, a catalyst and an inspiration for a new Nigeria. May God bless our clime with many more Emmanuel Uzor Onwes! Disclaimer: "The views/contents expressed in this article are the sole responsibility of Monday Eze, Senior Correspondent, The Nigerian Voice, Abakaliki and do not necessarily reflect those of The Nigerian Voice. The Nigerian Voice will not be responsible or liable for any inaccurate or incorrect statements contained in this article."